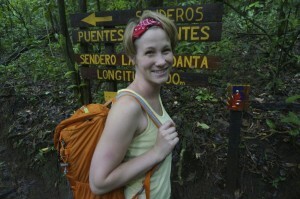 Kat and I recently returned from a trip to Costa Rica. Due to limited bandwidth and an overabundance of hammocks, we didn’t blog while we were there, but we did keep track of what we were doing. Because of its dramatic historical importance, I’m posting our blog, retroactively. Let us begin! We Arrived in San Jose very early Saturday morning, and Natalia’s mother Jenelle picked us up to take us to Margarita’s, her hotel from the previous night. Along the way, we stopped at a nursery to pick up a pot for one of her orchids back in Monteverde. Apparently plant nurseries are an important part of the economy around San Jose. We arrived at Margarita’s and were greeted warmly by a large pack of dogs. Not feral, but rather rescues. After showers, breakfast, and a lot of animal snorgling, we piled into the car and headed north west toward Rio Celeste. We passed a few coastal towns and stopped a at a roadside cafe for milkshakes and macaw watching. 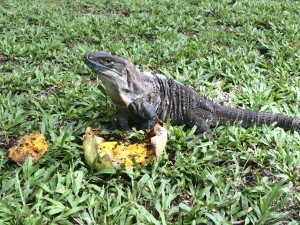 The cafe also boasted a small zoo with birds, iguanas and deer. We spent a great deal of time in the car napping or discussing the economy and social services available in Costa Rica. It’s an interesting place – very middle of the road and indistinct in a lot of ways. 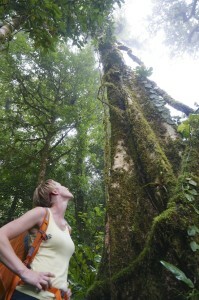 Eventually, we arrived at Heliconias lodge, near Rio Celeste. Actually, we’d planned to stay at another lodge, but a mix of confused reservations and confused itineraries meant this is what work out. Going with the flow! The lodge has a private forest reserve, apparently well regarded by birders. It’s fairly high up on a dormant volcano, with impressive views of the valley below. 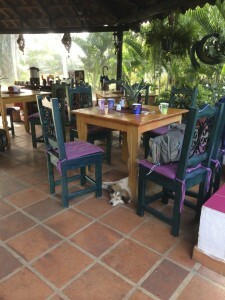 After a lunch in the lodge’s restaurant (do you want rice and beans, or beans and rice? ), we went for a hike. Knowing that tomorrow would be a slow-paced birding day, the aim was to tire ourselves out. We picked the “difficult” trail, up the volcano, which ostensibly ends at a lake. Normally, we read “difficult” as “difficult for other people.” In this case, it was “no, seriously guys – difficult.” It was a 2.5 kilometer hike. After 2 hours, with another 200 meters to go, we decided to turn back rather than risk losing the daylight. The rain soaked volcanic ash towards the top was incredibly slippery, make the going slow. As we got to the top, we came across a very large pile of what we believe to be tapir poop. And a sign encouraging people not to shoot tapirs. Both of us were under the impression that tapirs were cute little dog-sized creatures. Turns out they’re more “small hippopotamus” sized. So, glad we saw proof of their existence, but also glad we didn’t run into one unexpectedly. The wind, as we approached the top, was glorious, and had we had just a few minutes more, we could have pressed on. Next time. On the plus side, the descent as rapid! 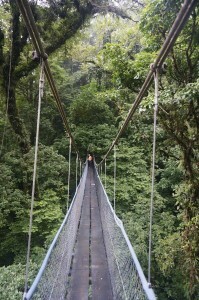 We arrived back down with plenty of time for another short walk – this time on a trail that includes three hanging bridges. These are an acrophobic’s nightmare (but, conversely, an acrobat’s delight). 100 feet above the forest floor, two boards wide, and swinging rather dramatically back and forth. The longest one was over 300 feet. They’d be more fun without the hand rope though (Kat disagrees). After returning and de-mudifying, we went down to town for a quick pizza. Then it was off to bed for a long night’s sleep.